When an enormous asteroid hit what is now Mexico some 65.5 million years ago and caused a global mass extinction - including the end of the dinosaurs - traces from the massive disaster were spread around the earth. Once and for all, life as it had been never would be the same. 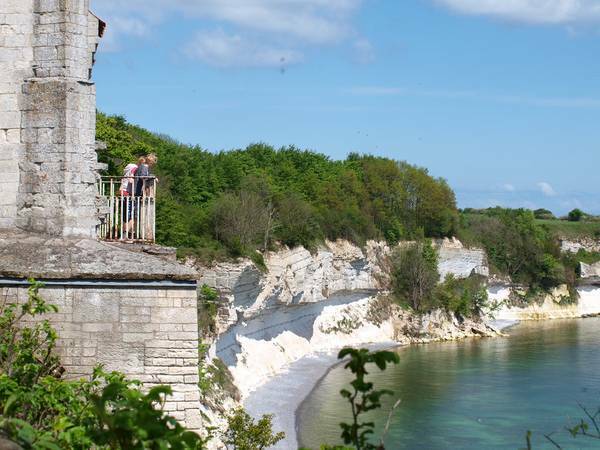 The coastal cliff Stevns Klint in Denmark – on the other side of the globe - is among the principle localities in the world that led scientists to formulate the hypothesis regarding the asteroid impact. In the cliff - below a church ruin and deep inside the tunnel of a former Cold War fortress facing the Baltic Sea - a thin dark layer known as Fish Clay between the chalk and limestone tells the story. Due to the special status which this asteroid impact has had for the history of Earth, the United Nations Educational, Scientific and Cultural Organization, UNESCO, decided in June of 2014 to add Stevns Klint to The World Heritage List as a place with outstanding universal value. The mass extinction asteroid - estimated to be at least 10 kilometers/ 6.2 miles in diameter - crashed down on Earth in what today is the Mexican Golf and the Mexican Yucatán Peninsula with an estimated force of 100 million megatons of TNT, scientists believe. (In comparison, the two atomic bombs dropped by the US over Japan during World War Two, combined, yielded about 0.04 megatons). Earth experiences a never-ending barrage of cosmic debris, but scientists believe that our planet has been hit by five mass extinction asteroids up through time, the so-called Big Five. The recovery after the natural catastrophe 65.5 million years ago led to life on Earth as we know it today. The natural disaster occurred during the transition from the Cretaceous period to the Paleogene period and, according to research, left traces of a metallic material, iridium, unusual in the Earth's crust, but common in space debris, such as asteroids and meteors/meteorites. Abundance of iridium in the clay layer at the Cretaceous–Paleogene boundary (known as the K/Pg boundary *) gave rise to a hypothesis that the impact of a massive extraterrestrial object caused the extinction of dinosaurs and many other species 65.5 million years ago. Stevns Klint is composed of soft chalk and an overlaying hard limestone. Between the chalk and the limestone is a layer of so-called fish clay containing the iridium. The band is easily visible and measuring up to several centimeters in width. 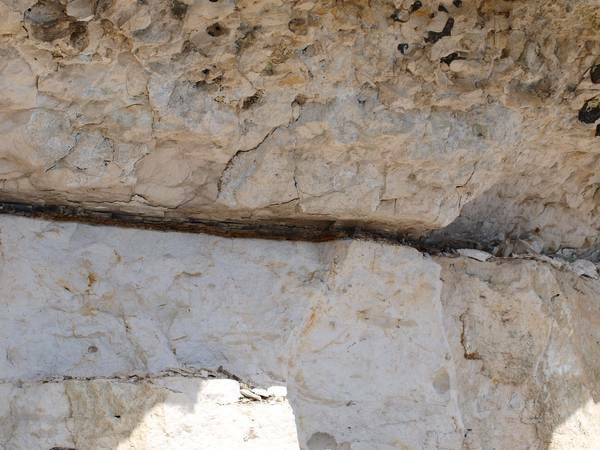 No iridium has been found in the chalk or limestone surrounding the fish layer. Over the years, scientists have located more than 500 such K/Pg (*) sites around the world. 17 locations are considered to be well-researched and documented, but according to Danish geologists, one of these locations stands out from the rest: Stevns Klint. The runner-up as number two on the list of 17 well-documented sites is the Seymour Island in Antarctica. With the acclamation of local authorities and experts, in February 2012 the Danish government signed an application to the United Nations Educational, Scientific and Cultural Organization, UNESCO, to have the coastal cliff Stevns Klint considered for the World Heritage List as a place with outstanding universal value. A decision by the World Heritage Committee is expected in June 2014. Foto: Cynthia M. Grund (2013). To tidligere mexicanske udvekslingsstudenter, søstrene Lydia (tv) og Candy, sammen med distriktsguvernør (2013-14) Jørgen Windfeldt på kirkeruinens 'balkon'. Stevns Klint is a 14.5 kilometer/9.0 mile-long coastal cliff located about 45 kilometers/27 miles south of the Danish capital, Copenhagen. The cliff is a feature of the peninsula of Stevns on the east coast of the island of Zealand (in Danish: Sjælland). The highest point on the cliff over sea level is 41 meters/134.5 feet. Deep inside the cliff, layers of fish clay can be seen in the tunnel walls of the nearby former cold war fortress, Stevnsfortet, now a cold war museum. The special underground, geological known as Bryozo-chalk, is extreme chock absorbing of both conventional shells and nuclear weapons on the surface. 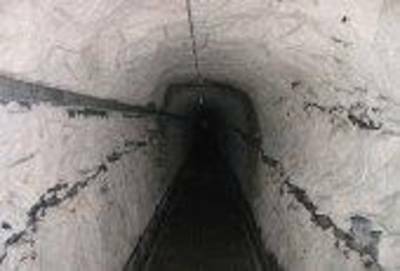 1.7 kilometers of tunnels were drilled and blown in the underground 18 meters under the surface. The fortress - looking over the Baltic Sea - was constructed from 1952 to 1953. In the document by the Danish World Heritage Steering Committee, it is argued that: "Stevns Klint is the most outstanding Cretaceous-Tertiary boundary (*) site found to date, showing the evidence of one of the most remarkable events of Earth history - the mass extinction at the end of the Cretaceous period." According to the Steering Committee, "the boundary layer presents evidence of an extraterrestrial impact and the Late Cretaceous and Early Danian sediments contain a rich and well preserved fossil fauna and nannoflora that document the impact and associated extinction event at the Cretaceous-Tertiary (*) boundary." The Danish committee describes Stevns Klint as "unique" compared to the other 16 well-documented sites "in having an easily recognized boundary layer, a high diversity of major biota groups offering information about the mass extinction and subsequent recovery, a high lateral extent of the boundary layer, and a high degree of exposure and permanency of the Cretaceous-Tertiary Boundary (*) succession." In 1980, the American physicist, inventor and winner of the 1968 Nobel Prize in Physics Luis W. Alvarez and his son, geologist Walter Alvarez, along with nuclear chemists Frank Asaro and Helen Michael, published a research article in the journal Science entitled "Extraterrestrial Cause for the Cretaceous-Tertiary Extinction." Their research had shown that layers in deep-sea lime stones exposed in Italy, Denmark, and New Zealand, respectively had increases of about 30, 160, and 20 times in the chemical element iridium – above the background level - at the time of the Cretaceous-Paleogene extinctions, more than 65 million years ago. • global mass extinction of 75 percent of all species and 50 percent of genera, including the dinosaurs. 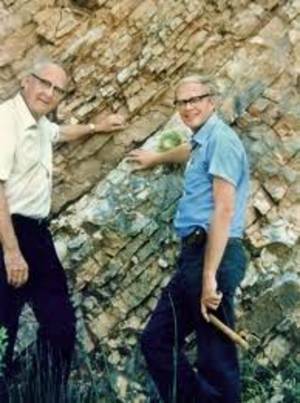 Geologist Walter Alvarez visited Stevns Klint in 1979 to take samples of the K/Pg (*) clay band, and the father-and-son team presented their findings at a conference in Copenhagen in 1980. Since the Alvarez’ theory of an asteroid disaster 65.5 million years ago, a large number of detailed paleontological, biostratigraphical, geochemical and sedimentological studies have been undertaken at the Danish locality Stevns Klint. The Alvarez theory set off a worldwide search to find the site of a mass extinction asteroid impact. One possible site was located during oil exploration in the late 1970’s at the Chicxulub Peninsula, but even as way back as the 1950’s Mexican petroleum geologists had become aware of an undefined underground structure in that area. Only in the early 1990’s the actual site, now known as the Chicxulub crater, was researched. A young Canadian geologist, Alan Hildebrand, took up the investigation as part of his PhD dissertation, and he is credited for having discovered the pre-historic impact crater. 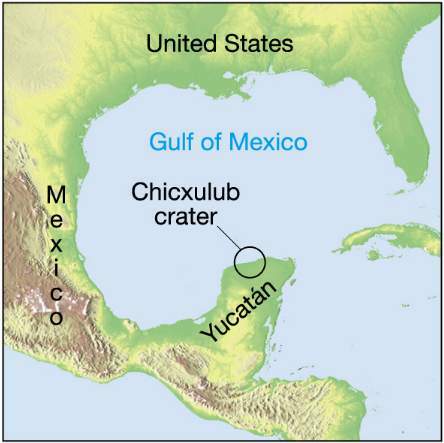 The crater is approximately 180 kilometers/ 112 miles wide, 10 kilometers/6.2 miles deep and buried beneath hundreds of meters of rocks and other sediments.Some scientist argue that the Chicxulub crater is only one of perhaps several impact craters that are related to the K/Pg (*) extinction event. Others believe that a high level of volcanism is to be blamed. Some even present evidence that both theories combined to nearly destroy life on Earth. PS: There is yet another place in Denmark where you can see the Cretaceous - Paleogene boundary. This location is named Nye Kløv in the municipality of Thisted in Northern Jutland. Neither the exposure nor the length of this site, however, is as beautiful and intact as those found at Stevns. The coastal cliff of Stevns is located in Rotary District 1480 which already is the home of a UNESCO World Heritage Site: The cathedral in the city of Roskilde, the burial place of Danish kings and queens for centuries. (*) The Cretaceous–Paleogene (K–Pg) boundary was formerly known as the Cretaceous-Tertiary (K–T) boundary. The "K" is for Cretaceous because the "C" was already taken for "Carboniferous" and Cretaceous is Latin for "Chalky" which is spelled with a "K" in German. The Pg is the abbreviation for the Paleogene period. The Tertiary (the "T" in the abbreviation "K-T boundary") has been downgraded as a formal time or rock unit by the International Commission on Stratigraphy. The Rotary E-Club of One of Denmark would like to thank Tove Damholt, geologist, PhD, director of Østsjælland’s Museum, and Kirsten Føns, biologist, cand.scient., Stevns Nature Centre, for valuable help and guidance in understanding of this pre-historic event, as well as research dating from the 1970’s to the present day that led to the nomination of Stevns Klint as a candidate for UNESO’s World Heritage List. 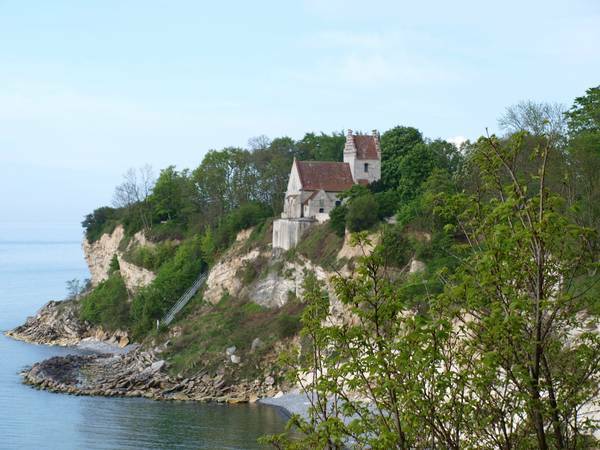 A special thank you to Kirsten Føns for having supplied us with pictures of Stevns Klint. Other sources used for this article can be found within the links in the text. 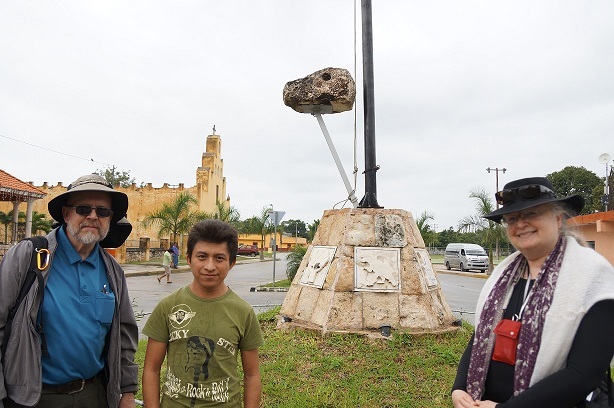 The asteroid event of 65.5 million years ago - one of the most dramatic episodes in the history of Planet Earth - is marked by a modest monument in the middle of a traffic circle next to a square between the city hall and the church in the small town of Chicxulub. Rotary E-Club 1480´s Charter-President, Haagen Cumlet, and his wife, Cynthia M. Grund, visited the historic site in January of 2014. They are here photographed with the local guide, Chicxulub’s Responsable de Cultura, José Francisco Escalante Tec. We hope that you have found your engagement with this story and its associated links informative. Please click at this e-mail address eclub@1480.dk and send us your feedback.